from midnight of Thursday as against Rs. 494.99 currently, Indian Oil Corp (IOC), the country's largest fuel retailer, said in a statement. This is the third straight monthly reduction in LPG rate. On December 1, subsidised LPG price was cut by Rs. 6.52 per bottle and by Rs. 5.91 on January 1. 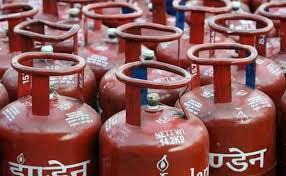 IOC said non-subsidised or market priced LPG rates have been cut by a Rs. 30 per cylinder "due to fall in price of LPG in international market and strengthening of US dollar-rupee exchange rate". "Accordingly, the upfront cash payment by the consumer of domestic LPG will also reduce by Rs. 30 per cylinder. Domestic LPG consumer will now be required to make upfront cash payment of Rs. 659 a cylinder in place of Rs. 689 per cylinder," IOC said. The subsidy transfer in the customer's bank account has been reduced from Rs. 433.66 in November and Rs. 308.60 in December.